This morning, a horrific shooting took place in Arlington, Virginia, and GOP whip Steve Scalise was one of the people shot. 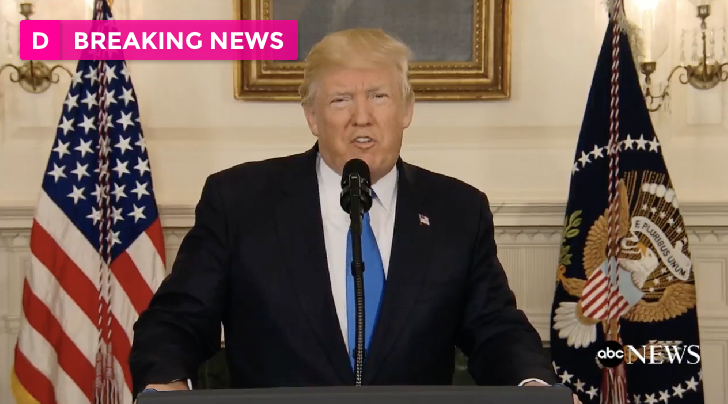 President Donald Trump just gave remarks to the press regarding the tragic event. “As you all know, shortly after 7 AM this morning, a gunman opened fire when members of congress and their staffs as they were practicing for tomorrow’s annual charity baseball game. Authorities are continuing to investigate the crime and the assailant has now died from his injuries. The FBI is leading the investigation and will continue to provide updates as new information becomes available. Congressman Steve Scalise, a member of house leadership, was shot and badly wounded and is now in stable condition at the hospital along with two very courageous Capitol Police officers. At least two others were also wounded. Many lives would’ve been lost if not for the heroic actions of the two Capitol Police officers who took down the gunman despite sustaining gunshot wounds during a very, very brutal assault. Melania and I are grateful for their heroism and praying for the swift recovery of all victims. Congressman Scalise is a friend- a very good friend- he’s a patriot and he’s a fighter. He will recover from this assault and Steve, I want you to know, that you have the prayers not only of the entire city behind you, but of an entire nation and frankly the entire world. America is praying for you and America is praying for all of the victims of this terrible shooting. I spoke with Steve’s wife Jennifer and I pledged to her our full and absolute support. Anything she needs. We’re with her and with the entire Sclaise family. I’ve also spoken with chief Matthew Verderosa. He’s doing a fantastic job of the Capitol Police to express our sympathies for his wounded officers and to express my admiration for their courage. Our brave Capitol Police perform a challenging job with incredible skill and their sacrifice makes democracy possible. We also commend the brave first responders from Alexandria police, fire, and rescue, who rushed to the scene. Everyone on that field is a public servant. Our courageous police, our congressional aides who worked so tirelessly behind the scenes with enormous devotion, and our dedicated members of congress who represent our people.